This is art?. September. 13, 2018 07:51. .
Modern art is considered vague and difficult to understand because it can be tricky at times to determine whether it is art or not. 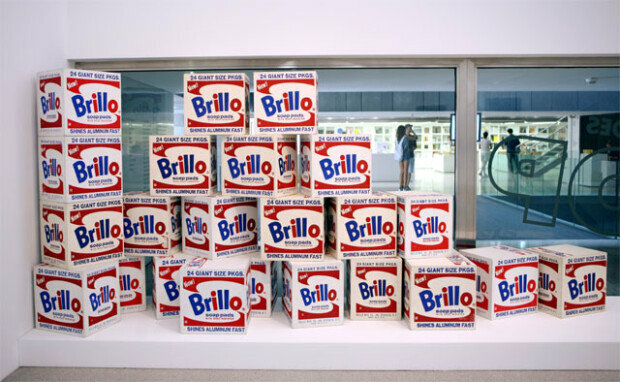 Andy Warhol’s "Brillo Box" is such an example. The components of the artwork appear exactly the same as the packages of Brillo, the sponge brand. The way they are arranged is also identical to boxes heaped in a store. It can hardly be viewed as unique, because it copied the product. Then why is it considered valuable? Warhol, who was previously a commercial artist, unveiled the Brillo boxes at his first individual exhibition held in 1964 in New York. He had a carpenter make a wooden box, which he painted and silkscreen the brand’s product logo. The viewers who attended the exhibitions scoffed, exclaimed over or enjoyed the Brillo boxes. The exhibition was even attended by James Harvey, the original designer of the Brillo package. Harvey was an abstract expression‎ism artist, but often worked freelance designing packages to earn money. He was shocked to discover that the boxes he designed were worth little, while Warhol’s boxes were worth hundreds of dollars. He was taken aback, but not raged or disappointed, because like most people at that time, Harvey did not consider Warhol’s boxes as artwork. Art critic Arthur Danto thought differently. He bade farewell to art upon viewing Warhol’s Brillo boxes and said that art should be viewed not with the eye, but with philosophy. The End of Art, as Danto put it, meant that the era for aesthetic pleasure had come to an end, ushering in a new era where the artist’s meaning mattered. Warhol used Brillo boxes, Campbell soup cans, Coca-Cola and actresses and other familiar and popular subject matters as his objects for the first time and became the American pioneer for pop-art and one of the most successful artists in the 20th century. In 2010, one of his Brillo boxes was sold for three million dollars at a New York auction. The price is reflective of Warhol’s innovative thinking ahead of the times and his incorporating his idea.